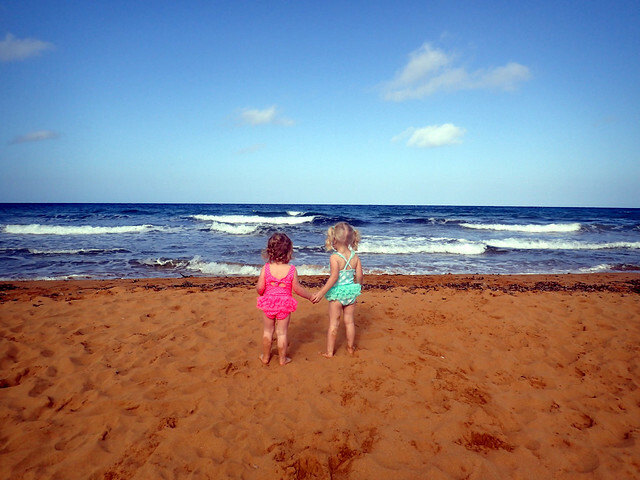 I have a knack for missing out on white sand beaches. I don’t mean to avoid them, I just happen to hit other ones instead. Black sand beach? Been there in Guatemala. 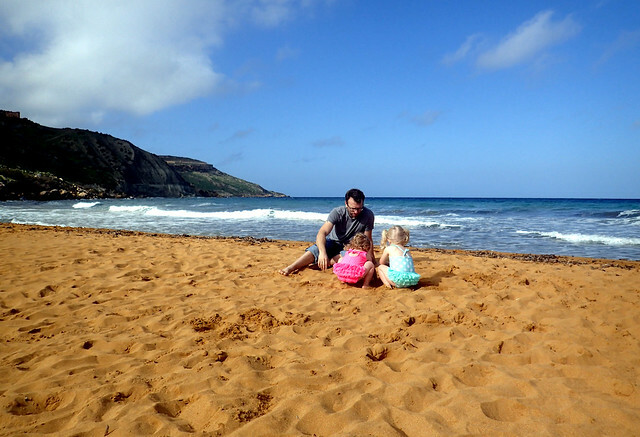 A beach so thick with palm fronds that you couldn’t tell what color the sand was anyway? Saw that in the Philippines. A shoreline formed by giants? That would be in Northern Ireland. Rocky beaches, pebble beaches, garbage beaches. Yep, yep, yep. 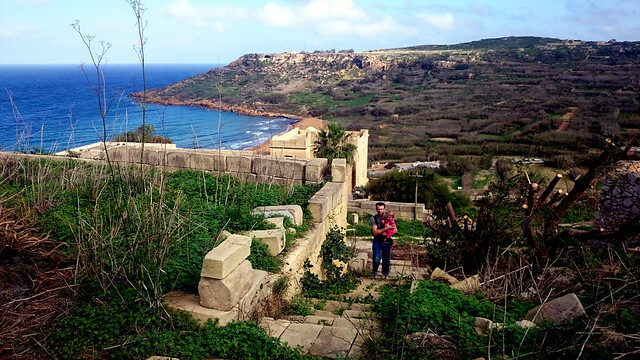 So when we arrived at Ramla Bay on Gozo, the fact that the sand beneath our toes was anything but white seemed pretty par for the course for my beach-going tendencies. The sand was red. Not red like a firetruck, but red like someone’s hair – which is really more of an orange color. Still, when I consulted the guidebook later, red is the adjective used, so I’ll stick with that. Either way, this post isn’t actually about sand. I’m just aiming to preempt any accusations of drastic photo manipulation. Doesn’t it look like I screwed with the color? But nope, it’s just red. What this post is actually about is the right and wrong way to get this red sanded wonder. 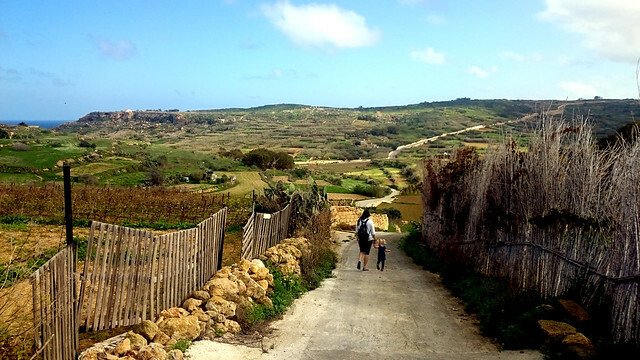 If you’re coming by foot from the little town of Xagħra, the short answer is, take the road. The long answer makes for more of a blog post through so read on. 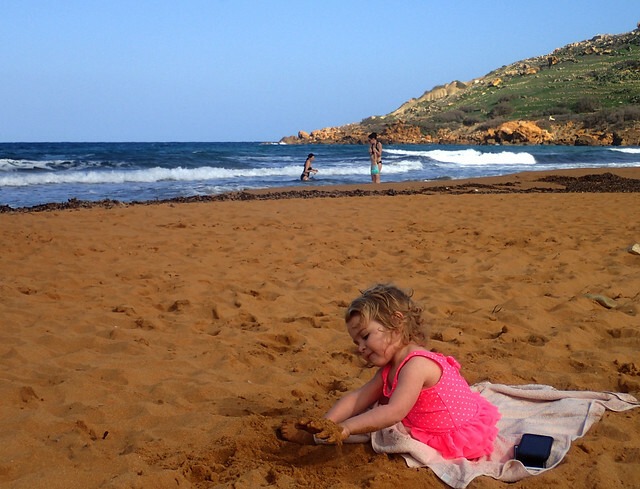 When we were on Gozo last November, Malta’s second island, we set aside an afternoon to head to this beach. 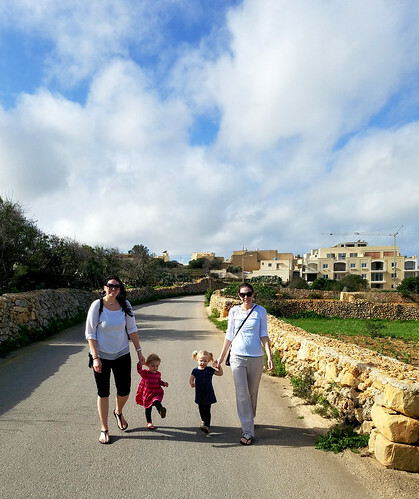 I was a little unclear just how long the walk would take us but the adults outnumbered the kids so I figured if Google Maps led us astray, which was a common problem on Gozo, we could just take turns carrying anyone who got tired. So we set out, swimsuits in hand, to see what we would see. Here we go! The day is young and the young ones still have a spring in their step. On our way there, we did it right; we took the road. From a bird’s eye view, the road seems a bit longer but it mostly just winds through peaceful farmland and, at least in the off-season of late fall, it’s really pleasant. Plus, if you do this, you’ll have ample opportunity to get cute pictures with rustic walls. Like Millie, here. So you can get an idea of how far the walk was from this picture below of my sister with Millie. But note that while, yes, the water is very far off in the distance, the weather is perfect and the hills are the nice kind that roll. The kind that doesn’t make you question your parenting decisions. 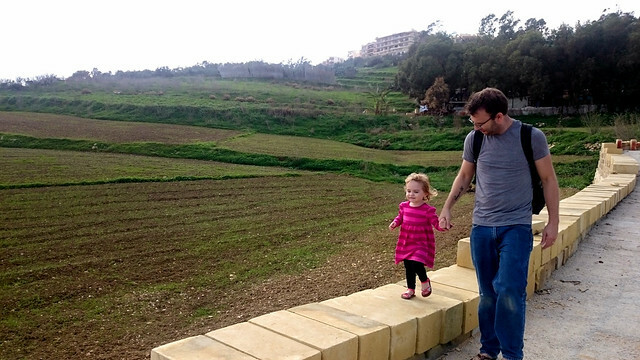 Looks like a nice afternoon walk to the Mediterranean Sea, right? Yep. 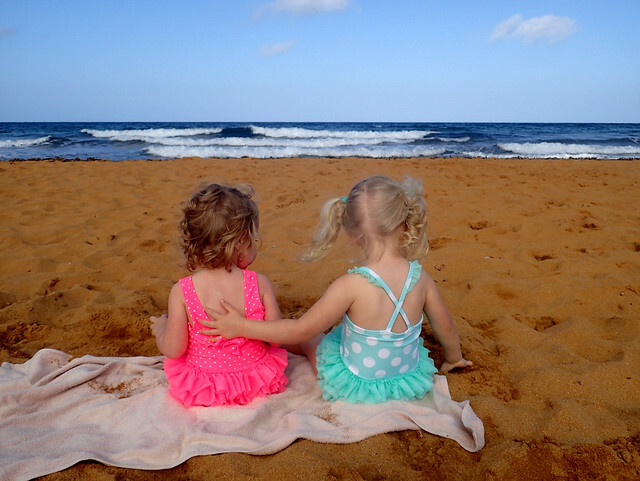 And then, after our pleasant walk, we reached the bay and the picturesque afternoon continued with Instagram-worthy moments of cute kids in ruffle bathing suits gazing out over blue water and cute, chubby toes wiggling in the warm, red sand. Of course, I didn’t know that Google was playing this cruel joke until we’d already started on our journey and it was a little too late in the day and late in the hike to turn back. This looks really pretty and all but I was just out of frame, ready to grab one of these girls if they darted forward. This is not just a grassy knoll with a nice view, we are on top of a steep mountainside. I swear, if poor Andy had a nickle for every time he had to follow one of my harebrained routes, we could just hire limo services to take us everywhere. Unfortunately, none of my pictures do the steepness of this trail any justice. 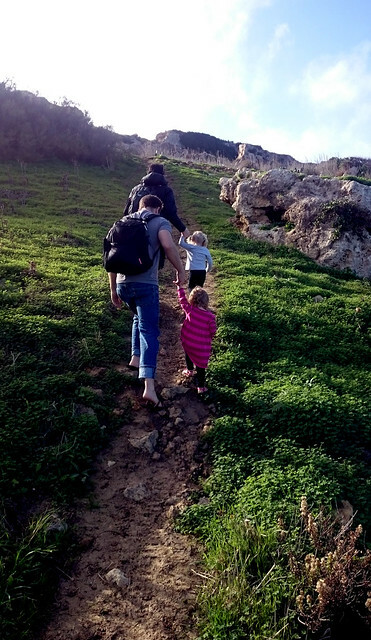 Guys, it was really rocky and it was really steep and may I reiterate that we were in flip flops, hungry and in charge of two unsteady and illogical kids, the kind the might just hurl themselves toward a cliff for funsies. And then, because I wasn’t doubting my parenting decisions enough, wouldn’t you know it, the ground started to rumble and the air started buzzing. The sound got louder and louder until we reached the point in our trek where we scared the bejesus out of a bunch of guys on dirt bikes coming around a boulder. At first we felt like the crazy ones. 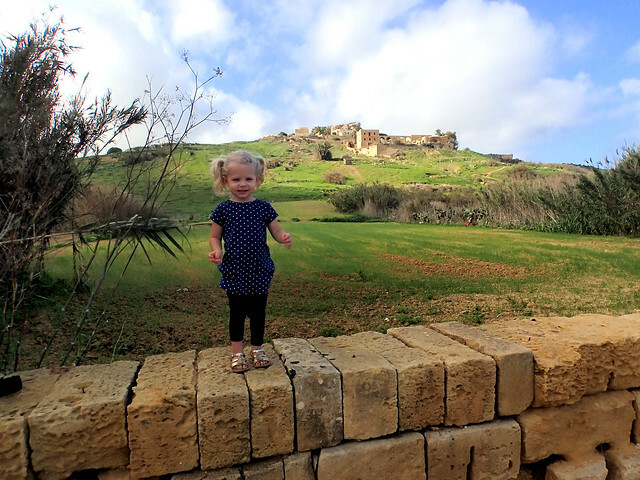 There they were, on some dirt bike tour around Gozo, when suddenly they came across us crazies taking toddlers on this treacherous path. Then we got to the stairs portion of the path and I realized, while we may well be crazy, I’m not sure they knew exactly what they were doing either. Seriously, did they go down this part? Surely not… right? So there you have it. Take the road. Unless you’re on a dirt bike, then by all means, feel free to hurl yourself down those cliffs and hope for the best, I mean, that seemed to be the thing to do. I will say, one plus about taking that path is that if you do happen to be hungry, like we were, there is a very welcome sight once you reach the top. The trail ends at the parking lot for people visiting Calypso Cave and while we didn’t visit the cave, we did visit the strategically placed food truck parked outside. Okay, I’m not going to lie here, this is what actually happened… We bought food, ate all of it in record time, started to leave, turned around instead, bought more food and scarfed it down again. Yeah, we were that hungry. I cannot recommend this place more. I think I got a hot dog and chips and a diet coke. Times two on the hot dog and chips. It. Was. Amazing. 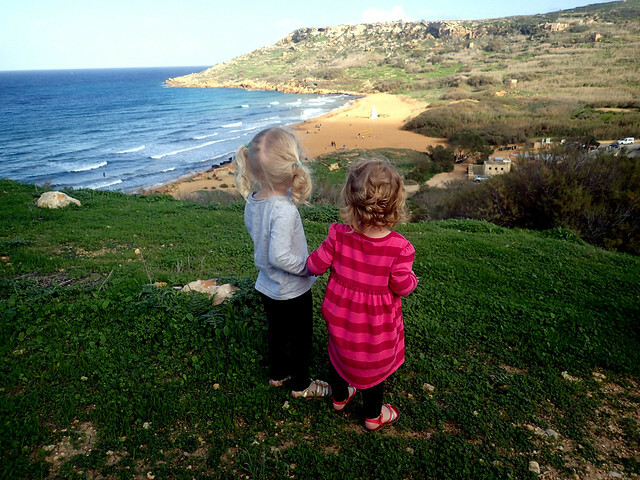 And because there are enough photos of people on white sand beaches out there and not nearly enough on red ones, I’ll leave you with a few more pictures from our sunny, fall afternoon at Ramla Bay. How much Millie loved playing in the water. And how much Paige didn’t. 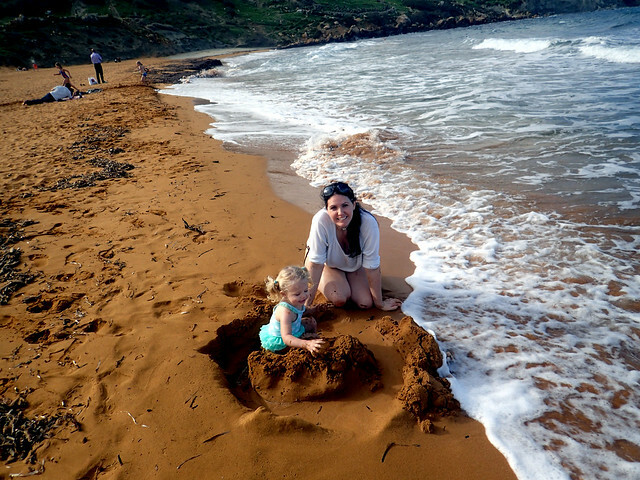 And how much my sister loves building a good sandcastle. 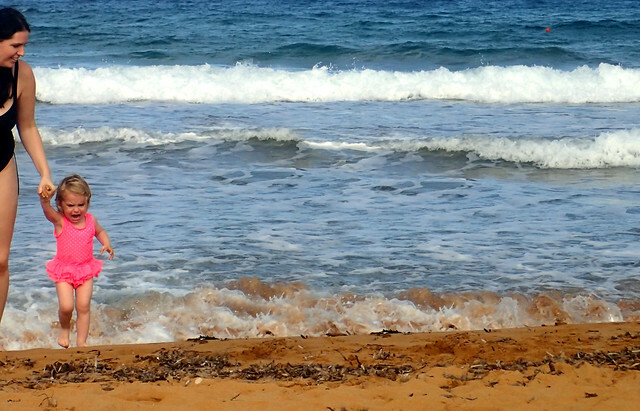 And how much everyone loves to stare at a pretty shoreline.